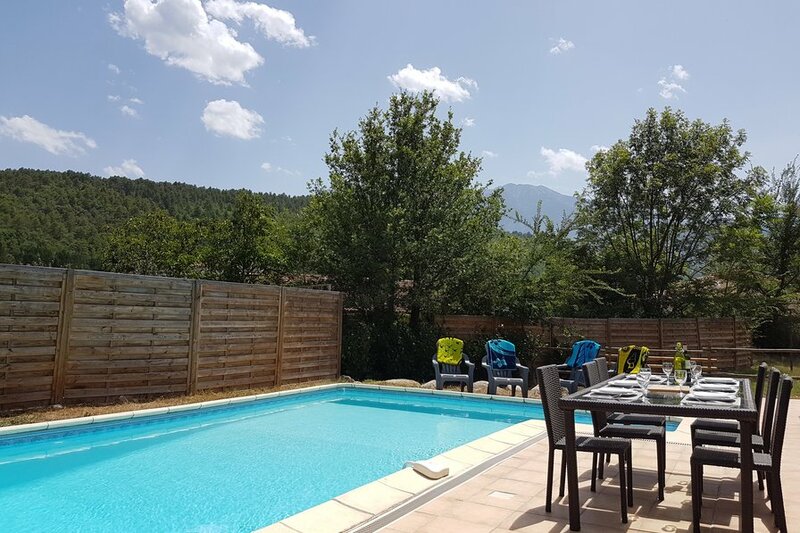 Villa Mimosa is a large 170m2 family villa with 2000m2 of land situated in the beautiful Rotja Valley in the peaceful rural town of Fuilla in the French Pyrenees with stunning views of Mount Canigou. With 4 bedrooms and an outdoor pool it is a fantastic location at any time of year in one of the sunniest regions of France. The mountain village gives direct access to the beautiful countryside of the Pyrenees and a variety of outdoor pursuits such as hiking, mountain biking, rafting, canyoning, caving and hiking. The UNESCO World Heritage walled town of Villefranche-de-Conflent is only a 5-minute drive away and the market town of Prades and spa town of Vernet les Bains only 10 minutes away. It is 50 minutes drive from both the ski hills of Font Romeu, Pyrenees 2000 and Les Angles and the sandy beaches of the Western Mediterranean coast. Spain or Andorra can easily be reached as a day trip. The property has 4 large bedrooms and comfortably sleeps 8-10 people. On the 1st floor are 2 double-sized bedrooms both with en-suite bathroom with showers. There is also a large family bathroom with bath & shower, and two twin bedrooms (both of which can accommodate an extra single bed or cot for an additional fee). All the bedrooms have direct access to a large balcony with fantastic views of Mount Canigou. On the ground floor, there is large well-equipped kitchen with microwave, dishwasher, American-style fridge/freezer and large 5 burner gas hob and electric oven and small breakfast table. The dining / living area boasts several comfortable leather sofas, a large 8-10 person dining table, 49' full-screen UHD TV and wood-burning stove. There is a separate toilet and access to the garage and utility room with washing machine and tumble dryer. The lounge and kitchen lead out onto the wrap-around shady terrace and garden & pool area. The 8m x 4m heated swimming pool has a covered patio area with a built-in barbeque. The villa lends itself to two 4-person families sharing or 1 large extended family, but would also suit groups. The nearest airport is Perpignan and is served by Ryanair, Flybe & Air France and is an easy 45 minute drive from the villa. Alternatively there are major international airports in Montpellier, Toulouse and Barcelona (Spain) served by all the major carriers (British Airways, Easyjet, Air France, etc) all of which are approximately a 2.5 hour drive from the villa on 2 - 3 lane major motorways. Other small airports include: Girona (Spain), Carcassonne and Beziers which are all approximately 1.5 hours from the villa and are served by Ryanair, EasyJet, FlyBe, British Airways or Air France. The price includes all utilities, bed linen and towels and end-of-stay clean. Bookings are confirmed by payment of a 25% non-refundable deposit. The balance plus €300 security deposit is due 60 days before arrival. The security deposit is returned in full providing the property is left in a tidy and undamaged condition. Nightly rate is 15% of the weekly rate. Minimum stay is 7 nights. For information about other lengths of stay, please contact us.